This Spirit led practice is designed to retrain your body and your mind to move from a stressed state to a relaxed state. It is in this beautiful state that we grow deep, strong roots to weather life’s storms and open our hearts to receive god’s grace. As we heal and reconnect, we begin to move forward with courage, confidence, and clarity. You can expect a unique blend of gentle movement, resting postures, breathing techniques, and guided relaxations. 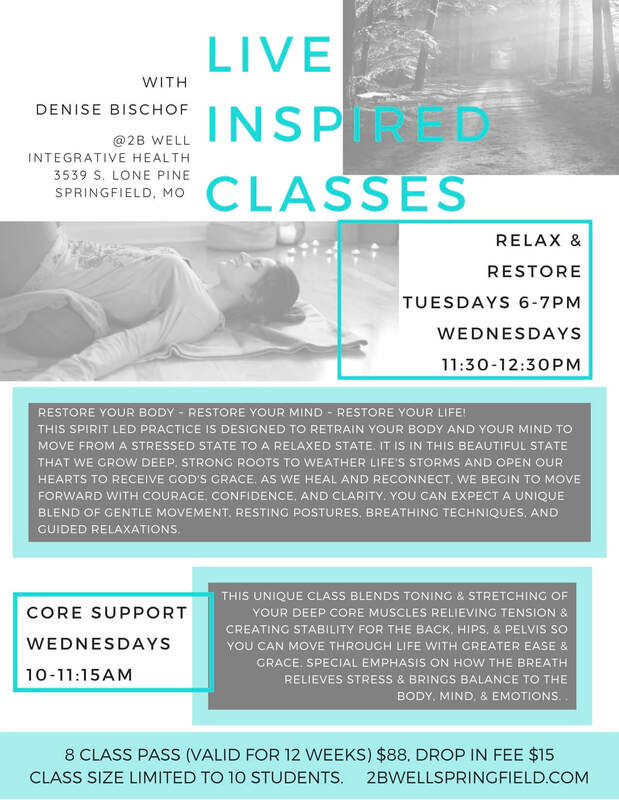 This unique class blends toning and stretching of your deep core muscles relieving tension and creating stability for the back, hips, and pelvis so you can move through life with greater ease and grace. Special emphasis on how the breath relieves stress and brings balance to the body, mind, and emotions so you can experience greater peace, joy, and contentment. This gentle, effective class is suitable for all students including the beginner and those with low back and hip issues. Restore Your Core is a whole-body method to retrain our core and pelvic floor muscles to be functional, reflexive, responsive, and supportive to our body. Restore Your Core helps you learn to move better, exercise better, uncover movement compensation patterns, and create new patterns of strength, mobility, length, and support.